This attractive set is in the same line as EMI Classics’ superlative and largely analogue Collector’s Editions for Vaughan Williams and Britten. The company’s prodigious recording schedule of British music in the period from 1960 to the late 1980s provides a munificent seam from which to quarry sets such as this. Many have of these recordings been reissued already in various permutations (review) but never before in such a masterly and encompassing sweep. The six CDs add up to a generous and purposeful romp through the Holst back catalogue. We encounter so much across these six 70+minute discs. The earliest recording dates from 1956 – Sargent’s still splendid and tense Beni Mora through to 1993 with Menuhin’s only very slightly slackened 1993 A Fugal Concerto. The fleshy predominance harks back to the 1960s and 1970s. Everything is in good heart from an audio viewpoint with a few carrying an unexceptionable analogue 'hush'. Holst was born in Cheltenham and became a pupil of Stanford and a life-long friend of RVW who outlived him by a quarter of a century. It is said that his early Sanskrit opera Sita was rather Wagnerian and perhaps none the worse for that. He moved in literary circles and knew William Morris whose death he commemorated in the middle movement of the Cotswold Symphony just recorded by Naxos with Jo-Ann Falletta (8.572914) and previously by Douglas Bostock on ClassicO, now Alto. His instrument was the trombone and this can be heard to luminous and rip-roaring effect in the dances from The Perfect Fool in which he lampoons Wagner among others. The fairytale frolics in the full work are at once witty and sumptuous. It’s well past time that the whole thing was recorded. The Planets is his single most successful piece and it still wows audiences and wins new friends. On the other hand such potently concentrated works as Egdon Heath, such religiously mystical works as The Hymn of Jesus and such lyrically lavish works as the Keats-based Choral Symphony present many other facets for those who will delve below the surface. He died in the same year as Elgar and Delius each of whom have had their own EMI Collector’s Edition before this: Delius and Elgar are represented alongside those already mentioned. It’s an alluring series. EMI by no means offer the complete Holst and lay no claims in that direction. Savitri is on Hyperion, Decca and Phoenix. The Cloud Messenger is on Chandos. The complete Rig Veda sequence was recorded by David Willcocks on Unicorn-Kanchana. Lyrita Recorded Edition fills most of the orchestral gaps left by EMI’s efforts – a handful of CDs from that source would form an ideal and singular complement to this set. In that connection let’s also not forget the connoisseur clutch of Decca Eloquence reissues and the two Hickox entries from Chandos (review; review). Holst’s catalogue is so varied. He wrote in pretty well every genre as did RVW. True, the chamber sonata seems to have held little allure for him and there is no string quartet and no soloistic concertos as such but in his allotted span he encompassed pretty much the same format range as RVW who lived a quarter century beyond Holst’s death. Favourites here are numerous and there are discoveries to be made by all but the most fanatical. Sargent is utterly masterly in Beni Mora – an exotic memento of North Africa and very much in the same line as Biarent’s Contes d’Orient and Rimsky’s Scheherazade. Bax’s Mediterranean which is Beni Mora’s counterpart is pallid by comparison. The recording engineers did a great job and I recall playing to death a thick ten inch secondhand LP of this Sargent recording some three decades ago. Sargent’s RPO St Paul’s Suite gets the big band treatment but is still light on its toes and keen in attack. This contrasts with the cleaner lines achieved by Imogen Holst with the ECO on Lyrita. The Op. 26 Rig Veda hymns with orchestra – especially To Agni speak in sympathy with the mystical style of The Hymn of Jesus. The Ode to Death, though as short as a concert overture, belongs in the same exalted company – another Whitman setting and a further living relic of the Great War - cf Hickox on Chandos. Seemingly polar opposites – Boult and Previn - coexist on the first CD. Boult’s final Planets is well regarded. I have not checked but this was, I think, his fifth planetary foray. It is in very early digital sound but has little of the glassiness typical of such offerings. Previn’s 1970s EMI Planets is well worth hearing as is Handley (review) and John Eliot Gardiner on DG. As a provocatively eccentric palate-enlivening change try out Svetlanov on Brilliant, George Hurst (desperately underrated) on an old Contour LP and Bernard Herrmann’s much despised Phase Four effort (review). Boult’s 1960s Hymn of Jesus on Decca is still a bellwether and compares well to the Groves recorded here. His Planets is craftily structured and although seeming more protracted than others it is memorable and is built for long acquaintance rather than cheap immediacy. Previn – then all long flowing hair, flowery shirts and ‘American’ pizzazz had migrated from RCA where he had recorded an estimable RVW symphony cycle. His Holst is snappy, alert and pointed though Boult has the edge on him in his Decca Perfect Fool dances. It’s a closer run thing in the undemonstrative yet inexorable Egdon Heath again recorded by both conductors. Egdon looks across the decades to Dawn and the Passacaglia from Britten’s Grimes. There is a spectacular recording of the latter from Previn for EMI which gives Boult a run for his money. CD 3 marries up two fiercely stern and even apocalyptic choral works (Psalm 86 and A Choral Fantasia - long disc-mates on a World Record Club LP) with the brass band music. The latter is conducted alertly by Imogen Holst with the Central Band of the RAF and the BMC (Oxford) Band. Wing Commander J L Wallace conducts the same RAF band in the mystical and bipartite Hammersmith which you can hear in its orchestral get-up on Lyrita. These still sound splendid though I rate the Fennell versions on Mercury very highly too. CD 4 is all vocal. It is distinguished by the work of the Baccholian Singers. The imposingly concentrated Dirge for Two Veterans again sets Whitman; indeed there is also a Whitman Overture but not here (Lyrita; ClassicO; Alto; Naxos). Other themes are present as well. Holst’s folk inclinations are there in the Choral Folk Songs H136 and the Choruses H186. His Hardy sympathies appear in the substantial setting of The Homecoming. Vedic learning surfaces in the Hymn to Manas which opens the disc and reappears in the hieratic singing of Frederick Harvey and the sympathetic pianism of Gerald Moore in Varuna on tr. 18. 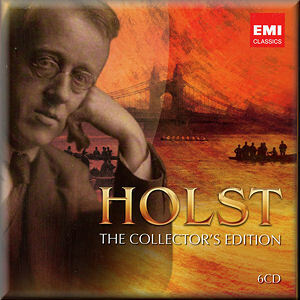 The Holst songs are surveyed more systematically on Naxos. Bring us in good ale – here fleetfootedly done by The King’s Singers reminds us of the bibulous Warlock and Moeran and of Holst’s and RVW’s walking holidays in the Cotswolds. His efforts catering for the Church of England can be heard in the welcome last four tracks squirreled together by EMI from various corners and hymnal collections. There are still works remaining to be recorded notably the operas Sita and The Perfect Fool; holy grails each and not quite as remote a prospect as Boughton’s Arthurian cycle or Holbrooke’s Cauldron of Annwn. I am surprised that EMI never got around to recording his fairytale satire The Perfect Fool nor the early and allegedly ‘Wagnerian-bawling’ Sanskrit grand opera Sita. We ‘know’ The Perfect Fool from the much recorded ballet music but there's much more to it than that. Now that Chandos have recorded the equally satirical and delightful Poisoned Kiss it is well past time for a studio recording of The Fool. As for Sita, Chandos have done his perhaps similarly-styled Cloud Messenger cantata and Lyrita and Naxos his tone poem Indra. The magical Rig Veda hymns have in some cases been recorded for years - try the Imogen Holst version on Decca-Argo and the Willcocks on Unicorn-Kanchana. No doubt the creation of fully integrated sets of performing materials for Sita would be a great expense of time and funding. Yet I have every expectation that the listening public would flock to the standard once a recording was put on sale. There was in fact a Leslie Head-conducted extract (end of Act III) of Sita issued alongside on an Opera Viva LP with other rare British operatic excerpts in the mid-1980s. The only other shred available is on Lyrita SRCD 209 (the Act II interlude). Speaking of the Holst Indian connection brings us to the exoticism of The Hymn of Jesus which links to later works such as Szymanowski's Song of the Night and Stabat Mater. EMI, in making this recording, were setting themselves in competition with the still superb-sounding Boult 1960s Decca which can be heard in honest FFRR magnificence on the Decca Holst set. The EMI sound has great impact and good stereo spread in a work that moves in angelic antiphonal delights. The range from organ profundity to the soft silver of the female voices is wonderful. You can sample this in the Give ye heed unto my dancing finale (tr. 5). Good to see Richard Hickox's name mentioned as director of the St Paul's Choristers; he was later to a conduct a recording of the work for Chandos. This piece is vintage Holst with many hallmarks in ebullient and sensitive evidence. Those final billowing lighter-than-air Amens are magical. In fact the usually-Liverpool-based Groves here had one of his most successful sessions. The spun silver and gold filaments that twine and mesmerise remind us what a superb composer Holst was. This is music of mysticism and striding ecstasy. It makes a generous companion to A Choral Symphony. A change of gear comes with CD 6. The Wandering Scholar shows Holst's vitality borne along in kinship with his friend RVW's Sir John in Love. The lingua franca is pretty much identical. The plot is based on Helen Waddell's Chaucerian medieval tales. The pretty tame bawdiness would hardly raise an eyebrow now. The vocal acting here is vividly done and the enunciation very clearly done without preciousness. I liked the klaxon masculinity of the start of Someone is coming. Tear as The Scholar is in good voice despite the usual constriction at the strained top of his range. Tracked in eleven segments this is ideal for pleasure and study. At the Boar's Head is a problematic one-acter - more of a lyric interlude than a grand drama. Its subject sits comfortably alongside RVW's Sir John in Love (EMI; Chandos) but while Sir John is a satisfying full evening the Holst is, at about the same duration as the Choral Symphony, half an evening ... if that. Its delights are well shaped and marshalled in this sole recording. While making a pleasing companion to RVW's Sir John it is lower key even in the bombast of How Now and Harry is Valiant (trs. 20-21). There is at least one moment of Puccinian heat towards the end of the work - though I doubt Holst would have accepted that description. The tunes, we are told, are in large part from Playford's English Dancing Master of 1651. Holst assimilates them so completely that their origin does not intrude. The booklet is pretty decent: 10pp of track and discographical data, a single page capsule chronology and a better than respectable 6pp essay on the life and music by Daniel Jaffe. There are German and French translations also. None of the texts is provided though you may be able to find some of the words on the internet. This adroitly assembled set should sell like a bonfire and fully deserves to. It should serve to fuel a revival in the fortunes of Holst’s music on a much broader front than just The Planets.